As the title says I Copied And Stole,the E is for everything, but on the first card I changed the color of the middle balloon from Melon Mambo to Peach Parfait. 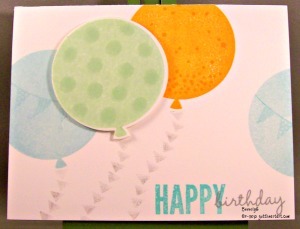 On the bottom card I changed the pattern paper, the card base color, and I'm not sure about the color of the balloon. I've slept since I finished up these cards. So I didn't quite Steal it all. I sure will be glad when my personal MOJO returns then I might not have to CASE. Before I go any further I want to give the two ladies I CASE-D these from credit. I don't know how to make a link to their YouTube channels, but if you go to YouTube and type in their names into the search bar they will come up. 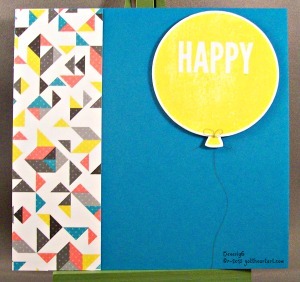 I typed in the name of the Stampin' Up stamp set, Celebrate Today, and looked around, these were the two I liked the best for what I wanted. These two cards were easy to make several of at a time. I'm finishing up the family and friends birthday cards for 2015 with my own handmade cards. People in the middle of the year had to make do with cards from the Dollar Store due to my cataract surgery. My vision is clearing up as each month goes by. It is nice just to have to have a pair of low power inexpensive reader glasses only for very close work. Whoops, I guess I've said all I'm going to this evening, general living is nipping at my heals.